Selective Sounds in San Jose, CA - Providing Universal and Custom Molds, Custom Inear Monitors and Custom Earplugs. What are the Benefits of In-Ear or Earphone Monitors? 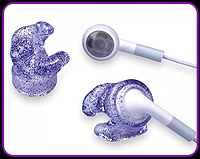 SOUND QUALITY: When you’re in-ear you can enjoy a clear mix at lower volume (which will reduce the risk of hearing loss) high-fidelity sound and less disruptions from outside noise. Also, your audience will enjoy a better sounding show by eliminating feedback and loud stage noise, often resulting from booming floor wedges that pick up sound from on-stage microphones. MOBILITY: Floor wedges are stationary and their sound is focused in only one place and direction. 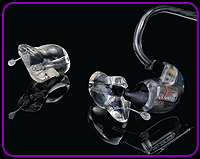 In-Ear monitors rest comfortably in your ears and allow you to go anywhere, on or off-stage, and hear yourself clearly. PORTABILITY: Floor wedges are heavy and bulky while the entire monitoring system can fit in a case that you can easily lift with one hand. The in-ears themselves would fit in your pocket and can be used for personal listening while traveling or wherever you like. CLICK HERE to view our class schedule. If you would like us to come to your location to offer a workshop, demonstration, or take impressions on-site we would be happy to discuss the details with you. Use the information below to get a hold of us or you can choose to use our calendar to view available dates for either hearing loss prevention classes or to book an appointment. CLICK HERE to go to our online calendar. While universal-fit eartips can provide a good fit for just about anyone, you can improve the comfort and fit of universal monitors with a pair of Westone UM56 custom earpieces. The Westone UM56 is comparable in size to the tips provided with most universal-fit musicians’ monitors, but ensure the comfort and seal that only a custom-fit product can provide. Custom earpieces designed for use with bud/button style stereo headphones. Book an appointment for your ear impression today! Call us at 408.225.0688. Thank you for your interest in Selective Sounds. 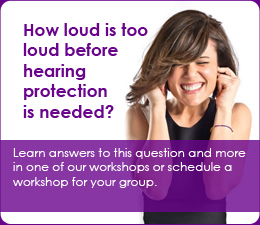 Delivering knowledge and solutions to prevent hearing loss and providing products to aid in hearing performance.